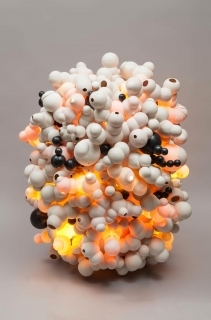 Martha Russo nomos (dot), 2013 porcelain 40 x 40 x 28 in. Before children have the language and cognitive skills to name an object, they explore the world with all of their senses. For instance, a chair is not a “chair” but something to climb on, to crawl under, to pile things on, and, perhaps, even to lick. With the acquisition of language and the awareness of what the thing is and what its purpose is, the investigations dwindle and the senses simmer. My hope is that people approach the works and stay with them because they are not quite sure what they are. Questions arise: What are those forms? What are they made out of? How are they staying on the wall, suspended from the ceiling, or hovering in space? Hence, the title, nomos comes from the Greek root ‘to wander’ and ‘to wonder’. Simply, I make abstract organic sculptures to give people a place to let language and purpose slip away and to allow the senses to frolic, to ponder, to delight. The title of these installations is inspired by the novel Shibumi,1979, by Rodney William Whitaker, who went by a pen name Trevanian. In the novel, the main protagonist, Nicholai Hel is a highly skilled assassin and a master gardener who is steeped in the practice of shibumi, a study of Japanese aesthetics. For Hel, the continued evolution of these two seemingly disparate practices came by way of years and years of practice and patience in order to develop an intangible sense of touch and timing. Working with what I call “live” materials such as clay, chemicals, and heat takes years and years of practice to begin to understand how to coax the clay and glazes to do what you want. After the works are completed, a further negotiation happens in figuring out how the forms will interact in space and with the viewer. The idea of shibumi resonated with me because of the nature of coming to know something through copious amounts of time, practice, and touch. Martha Russo & Katie Caron to exhibit in "Colorado Women in Abstraction" at the Center for Visual Arts, Denver, CO. July 15 - October 1, 2016.